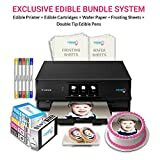 If you are planning to buy the best edible printer available in the market, then this buying guide is a good place to start. 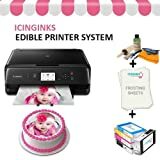 An edible printer creates preprinted images made of edible colors onto various food products, such as cakes, pastries, biscuits, etc. The paper used for printing is made of starch and sugar. Now your favorite moments can be whipped up by an edible printer. 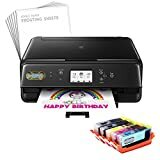 You can delight your young ones by bringing home an edible printer today. Edible printers are of two kinds. One kind of printers uses wafer paper, while the other kind uses frosting sheets. Wafer paper is edible and is made of starch. This paper cannot carry high-resolution images, so you can only print images bearing uniform colors, like those of leaves, wings, flowers, feathers etc. If you are planning to make a photo cake, then wafer papers are not the right substance for you. Another characteristic of wafer paper is that it curls up upon freezing. You may get this problem if you are storing your cake in the refrigerator. A wafer paper-based cake may curl or wrinkle if the base is too moist. Another risk if you are printing an image on a wafer paper is that it may dissolve. It is, therefore, worthwhile to be concerned about this condition when planning a party. Wafer papers have a smooth side and a rough side. The smooth side should be used to print images. One advantage is that pictures printed on wafer papers can be cut in several shapes. Frosting sheets are not actually paper, but layers of sugar that have been pressed onto the surface of a plastic sheet. You peel off the plastic backing when you want to apply the image onto a cake or other pastry. Unlike the wafer paper, a frosting sheet image has a better color resolution, which allows you to print several polychromatic images. These images also do not dissolve over a period of time. Bring home a frosting sheet-based printer to make your parties livelier. Frosting sheets gel very easily with the main body of the cake. You can also use a non-dairy food material while whipping up a food item on a frosting sheet. Based on customer reviews of edible printers, these were the top features that pleased them. 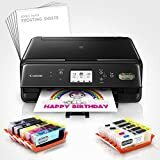 Clarity of images: Many users have given favorable reviews to edible printers they have bought because of excellent picture quality and faithful reproduction. Ease of use: A significant number of users said that, even though this product is quite a novelty, they found that its ease of use was something worth noting. The setup was very easy--even for those buyers who were using an edible printer for the first time. Customer Service: Some people who purchased this product for the first time said that while installing, the company's customer service was great. All the questions were answered promptly. Warranty: Check whether the product is covered by a suitable warranty. Ask the company whether the terms of warranty cover all of the printer's parts, or just a few. Maintenance: Check with the company about maintaining this product. Since you are eating products that are coming out of this machine, this means that the insides of this printer must be cleaned regularly. What are the procedures, and who has to do that? Is the ink safe? 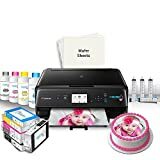 : Though edible printers and the inks used have been certified by food authorities in some countries like the United States, it is better to check whether the ink used in your edible printer is really good enough to be consumed. 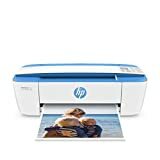 How easy is it to use uses printer? : Before you buy one, check it out by yourself to see how easy it is to use. It is a good idea for someone to illustrate to you how to use the printer. Canon- This brand has been in the printing business for a very long time. Canon is a Japanese brand and is known for its product innovation, quality, ease of use and great customer support. 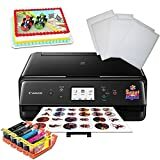 While other companies make edible printer ink and accessories, Canon is presently the only company in the world that makes edible printers. 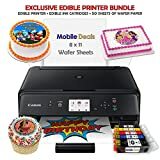 Canon makes printers based on wafer paper as well as frosting sheets.